What are the effects of too much screen time for kids? Some parents were not happy with this response. You should be extremely ashamed of the bogus conclusions you draw from this study and the hands-off message you are giving. How many families do you think manage their kid’s screen time? And how many do you think don’t and won’t because of your BBC headline? You are the abusers. How are kids expected to spend less screen time when most adults are also addicted?! As Prince once said, “…they only imitate their atmosphere”. “So there’s no evidence it harms and no evidence it helps, according to the article. There may be educational benefits to technology, and there will no doubt be an importance placed on training in technology as that is where the jobs field is moving towards (I mean, coding for 5 year olds?! )… but kids easily become fixated and that can result in withdrawal from socialization and hands-on creativity… how does that impact them in 10, 15, 20 years time? Matt makes an excellent point. Has there been enough time to accurately measure the effects of screen time for kids? This is what I’d like to find out. So, in this article, I’m going to go through RCPCH’s report and the later published guidance, as well as consult other studies and resources which can shed some insight into whether there is, in fact, any direct causal link between our children’s mental health and screen time. I will include first-hand accounts from a parent’s perspective as well. The RCPCH is a registered charity who aim to ‘transform child health through knowledge, innovation and expertise.’ Primarily, their work is based around informing paediatricians on how to care for infants, and CYP with health needs. The RCPCH drew on existing research on the health effects of screen time on CYP (which they call ‘Digital Natives’ as these CYP were born into the digital world) and outlined recommendations for both health professionals and families on managing screen time use. They found that children with higher screen time tend to have a less healthy diet and those who used the screen for longer than two hours per day showed depressive symptoms. However, they deduced that the evidence for a direct ‘toxic’ effect is weak, that harm is overstated, and the majority of literature they reviewed points only to the existence of a link with television screen time. Therefore, based on this weak research and lack of evidence they are unable to recommend a cut-off point to children’s overall screen time. Where the adverse effects arise are from the loss of other positive activities such as socialising, family bonding time, physical exercise and sleep, due to these being replaced by screen time use. The RCPCH states that if families are satisfied with the answers to the above questions, they can be reassured that they are likely to be doing as well as they can with this screen time issue. They do go on to mention that if you WANT to reduce screen time use, then the RCPCH offer practical tips to support your decision. The infographic guide below is taken from RCPCH’s website and is based on a consultation with 109 CYP from across the UK aged 11 to 24 years. 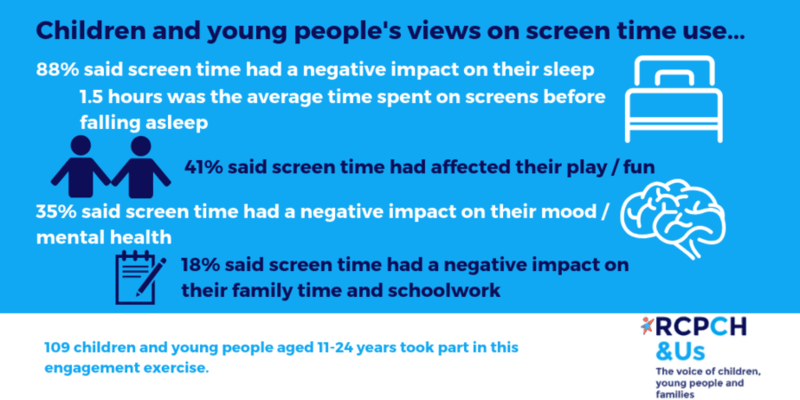 The infographic shows CYP’s views on screen time use. The RCPCH’s guide also mentions that screen time is a part of our ‘digital natives’’ modern life and a necessary part of modern education. And where the evidence is contested is that poorer mental health amongst CYP in the UK predates the onset of social media and digital technologies. The RCPCH do note, however, that there are a separate set of concerns from parents about the specific content of screen use, with particular concern over the impact of social media on CYP’s mental health. There is no further offer of elaboration on this area in their report apart from a reference to consult existing guidance from the NSPCC. So, why all the fuss from parents? We’ve been given the green light to dictate our own rules about screen time at home, and RCPCH state that we shouldn’t worry about the effects of screen time on our children’s mental health. So, what is all the fuss about? Well, it’s clear that there isn’t enough evidence to show that there isn’t a direct causal link to mental health (as well as other physical implications), so why advise parents to not worry about the impact of screen time in children? Our ‘digital natives’ are only in their twenties now. So, is there enough evidence to show the long-lasting effects if we’re not even there yet to study the results? I looked at other relevant studies from around the world to further understand why there wasn’t a direct causal link. In China, there was a one-year long follow up study on 2,521 Chinese college students to examine the impact of screen time on their mental health. The study found that the overall effects of mental health and screen time were consistent, albeit small. The study called for future examination into the association and direction of causality. A study in Australia examined the longitudinal associations between recreational screen time and mental health in 322 Australian female grade 7 adolescents who reported to exceed the recreational screen-time recommendations which were set at less than two hours per day. 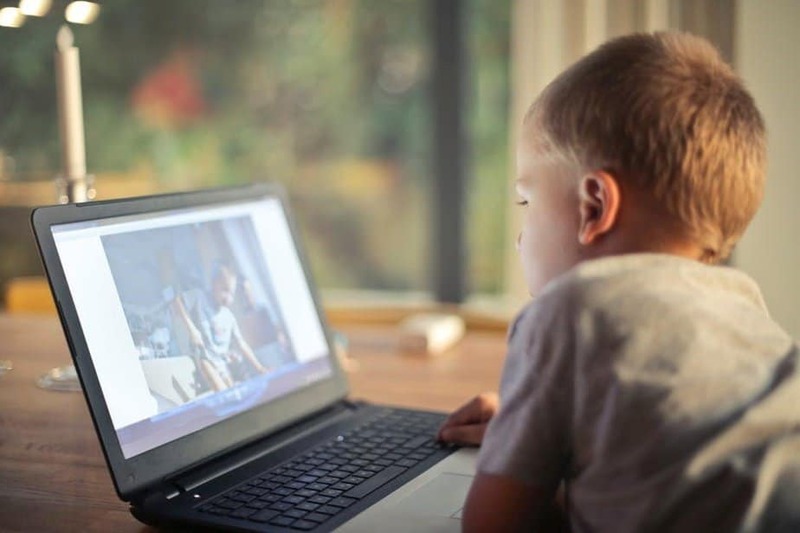 The study lasted for six months, and the results showed that there was a positive correlation between the changes in total screen time and psychological difficulties, although there was no association found in computer use for homework. There was, however, a positive association with mental health problems and recreational computer use. Changes in tablet and phone showed an adverse effect on children’s physical wellbeing. The study deduced that reducing recreational screen-time may increase welfare in adolescents. Another study in China reviewed 4,747 college students and found that 16.3%, 15.9% and 17.3% of the students had psychological problems, such as anxiety, depression and psychopathic symptoms respectively, due to low physical activity and high screen time use. The study called for interventions to take place to reduce screen time and increase physical activity in the lifestyles of young people, and that future research should develop and measure the impact of these interventions, and their potential effects on sleep, health and wellbeing. A study called the A.B.C.D Study (for Adolescent Brain Cognitive Development) found that MRI scans saw significant changes in some of the children’s brains who used screen time more than seven hours a day. Children who reported to use more than two hours of screen time a day achieved lower scores on their thinking and language tests and, as a result, their brain scan showed a premature thinning of the cortex, which is the outermost layer of the brain that processes different types of information from the senses. Scientists now want to look at whether screen time is the culprit for the thinning cortex and whether these are meaningful differences that lead to attention deficits, mood problems or delays in reading or problem-solving ability. Other studies found similar results, and it seemed that the overall consensus was that decreased screen time and increased physical activity positively affected CYP’s mental wellbeing. It was also found that decreasing recreational screen time had a positive impact on CYP’s mental health as well. Should we be more worried about what kids are watching, rather than how long they are watching it for? And this onset of social media and the internet is so new, that we are unable to examine the long term effects because we are merely not there yet. Below is an audio of my talk with Mike Sweeney From BBC Radio Manchester, discussing the very same problem. “Screen time is often a topic of conversation in our household. Myself and my husband own a desktop computer, a laptop and a tablet as well as our smartphones. We both run our own businesses and are often using our devices to communicate and check emails. I run an online business, so tech is an integral part of my world. I work from home, so the children will often see me sitting at my computer or browsing social media on my phone. I think technology is great for kids. I have a two-year-old girl and a 5-year-old boy. My 5-year-old in particular benefits a lot from apps that help improve reading, writing and math skills. Numerous learning applications are accessed online that we have been advised by his school to utilise such as the mathletics platform which provides a fun and interactive learning environment. “Any human with an ounce of common sense knows that everything in life should be within moderation. The way this latest study was reported this week was darn right lazy. They took a snippet and posted across every platform and network for all to see. As much as we hope that common sense will prevail, we also know that there will be many people who will take the headline at face value, do no further reading and deem that screen time is now all hunky dory because the news said so. They’ve both had screen time from the age of two, and it does form part of our daily family life. They are both very energetic and like nothing more than running/jumping around the house and garden, so for us the screen time represents a good time for them to sit still! Plus my son is starting to play games like Mario Kart and FIFA which are good life lessons in learning to lose. They probably spend a bit longer on one ‘session’ than other children, but we’re comfortable with the overall balance across a week, taking into account nursery, school and other activities. Both of my two have a good relationship with their screens, there are no issues if we ask them to turn them off and there are no close screens before bed. They use their tablets in the lounge so that we can keep an eye/ear out for anything unsuitable. · take personal time away to recharge when having to interact with a lot of people or in a busy environment. These are all vital things for Morgan. Taking it away can be like taking away someone’s glasses or walking stick, but we do manage this alongside other things like physical toys, books, and tv, and we are also careful to stop tablet time an hour before bed. This actually applies to all the kids because the blue light can cause sleep disruption. After this time we read and play Orchard games together as a family. Younger children require face-to-face social interaction to learn and develop their language and other skills. And while some screen time can be beneficial if used in moderation and content is supervised, there is no substitute for getting the kids outside and exercising, playing with their friends, and spending time with the family. Sleep deprivation in children can massively impinge on their mental and physical health, whether they have screen time before bed or not. The RCPCH advise to have a plan and stick to it, which is a principle that is borrowed from standard parenting practice And I agree with this notion. It is essential to be consistent in your approach to how you adapt your own screen time rules. 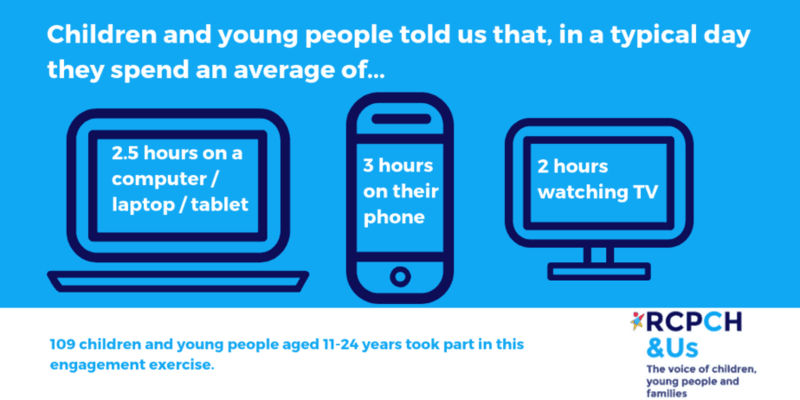 Netvouchercodes carried out a survey on 3,255 parents and found that the overall average time kids spend on their tablets is around 46.8 minutes per day. Check out the infographic below, which also includes advice from parents like me regarding tips on kids using tech. The way my husband and I limit screen time at home is that we operate on a ‘Rule of 10’s’, and this rule can only be applied when the kids have finished their homework or daily extracurricular activities. They must complete a 10-minute chore (i.e. help with the dishwasher, or tidy their room etc.) and the completion of that chore earns them 10-minutes to play either on the phone or tablet. Then they must pass on the phone to the brother who’s waiting. The ‘Rule of 10s’ means that they must earn the use of the gadget and that the limit is clearly stated in a way that they understand, i.e. 10 minutes. When should you allow for screen time? In our house, the kids can earn more 10-minute rewards, but this is capped at one hour and must be used up by 4pm otherwise, it is rolled onto the next day. However, there is a blanket ban on the use of screens at the kitchen table, and at least two hours before bedtime, hence we have operated the rule of no screen time after 4pm. I find this limit aids the boys’ sleep and allows them to ‘switch off’ easier than if they are staring at a screen before bed. The RCPCH advise to praise children that respect boundaries, and we do that by offering our kids points that lead to prizes. So, if they’ve accepted the screen time rule without complaints, that generally leads to points awarded for good behaviour. I think it is important to reward good behaviour and not bad behaviour, as this teaches children that not only will their parents acknowledge their compliance, but they earn lots of praise and attention too, which is essentially what kids want in the long run. Parents are getting addicted too! Kids are not the only ones that need a cap on their screen time – we adults need it too! We need to set by example and not allow for screen time when kids are around if you can help it. I’m guilty of spending upwards of four, five or six hours staring at a screen every day due to the nature of my job, but I make sure I shut up shop when the kids are around me and pick up my work again when they no longer require my attention, i.e. at school or in bed. This means that we all benefit from the much-needed family time when we are together. Simon Sinek, Jim Kwik, Mel Robbins and Jordan Peterson offer sound advice on how to break your smartphone addiction now! Simon Sinek also explains very clearly why we have a generation of mini addicts and it’s all related to the screen! 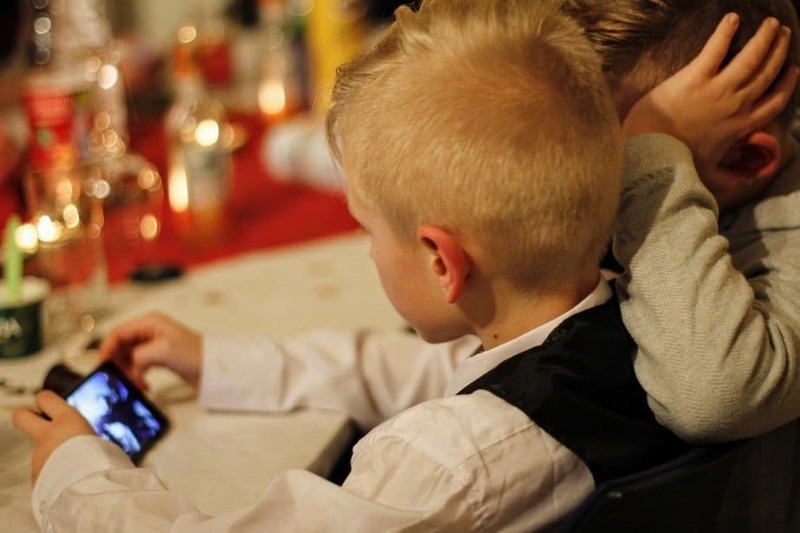 The RCPCH’s advice has caused quite a stir amongst parents in the UK, but questions about screen time still remain unanswered. While I agree with the RCPCH that there is inconsistent scientific evidence to show the direct causal link between screen time and mental health, other questions related to excess screen time use need to be answered before they can advise parents ‘not to worry’. For example, what are the long-term physical implications (eye damage) and how do we control what kids are watching these days when our generation of parents have no idea what we’re up against, especially in regards to the deep dark web? And does screen time have a negative impact on children’s mental health when they’re in their thirties, forties and fifties? As Simon Sinek pointed out quite rightly in the video above that we are breeding kids with an addiction to screens, who are relying on getting their self worth from the likes they gain on social media, not from a human being. This causes high amounts of stress, which can lead to mental health issues, like anxiety and depression. I think we can conclude to say that more emphasis needs to be made on what kids are watching rather than how long they use screen time for, as long as they don’t exceed two hours per day. And while I agree that the onus should be placed on parents to control what, when and how much screen time our kids are using, we need proper guidance to show the full adverse effects before we can understand how necessary the controls are. For that, we must turn to the experts in the industry to undertake ongoing studies and research before it’s too late for our digital natives. If you have any comments about RCPCH’s report or my article, please do not hesitate to comment below. I am always interested in learning more from parents and experts alike. 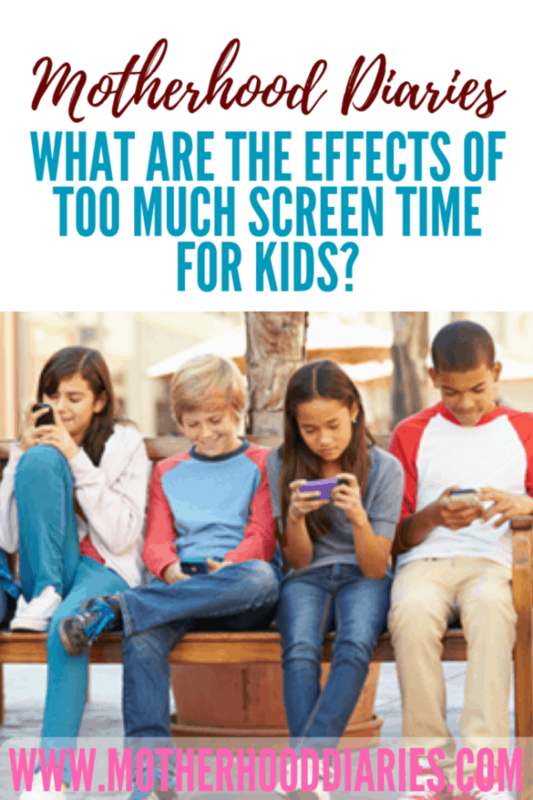 Please pin and share the effects of screen time for kids! Stiglic N, Viner RM. The effects of screentime on the health and wellbeing of children and adolescents: a systematic review of reviews. BMJ Open 2019. Gireesh A, Das S, Viner RM. The Impact of Health Behaviours and Deprivation on Wellbeing in a National Sample of English Young People. BMJ Paediatrics Open. 2018;In Press. Bruni O et al. Technology Use and Sleep Quality in Preadolescence and Adolescence. J Clin Sleep Med. 2015 Dec 15; 11(12): 1433-1441. Children’s Commissioner. Digital 5 a day strategy 2017.